The Alpine is a classic Chalet model with over 25 years of history on the books. The base weight of the Alpine is actually a little less than the same-length Aspen and Arrowhead. Since all three trailers are built on the same platform, and have the same GVWR of 3,000 lbs, that basically means that you can haul a little more cargo in the Aspen—or tow it with a slightly less powerful tow vehicle. 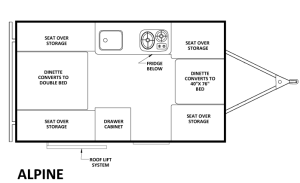 Unlike the Aspen, with its rear L-sofa, the Alpine comes with a standard dual dinette for more seating and sleeping space. Aside from that feature, the Alpine offers the same standard and optional equipment that you can get with the Aspen and Arrowhead models. 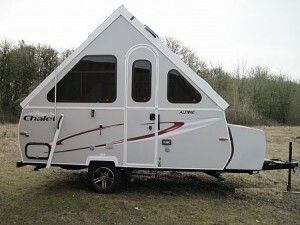 The Alpine comes with the same basic slate of standard features available from the Aspen and Arrowhead, including Chalet’s patented manual roof lift system. This system is designed to make it easy to set the camper up without stress, strain, or outside help, without the additional expense and weight that you’d get from a powered system. Like the Arrowhead and Aspen, the Alpine comes standard with a suite of convenient appliances, like a two burner cooktop, 2.0 cf fridge (upgradeable to a 3.0 cf fridge/freezer combo), a 16k BTU furnace, and a 3-speed fantastic vent fan. The entertainment system comes with a standard AM/FM radio, CD/DVD player, cable hookups, and optional external speakers.